Visitors can learn the process of oil refinement theoretically and practically, dine with oilmen and even try to use a piece of machinery. 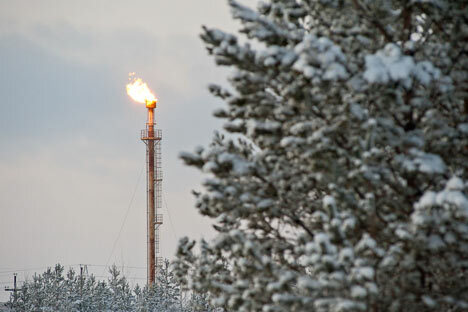 In the Khanty-Mansi Autonomous Region, there are hundreds of flares, used to burn off natural gas that reaches the surface together with the crude. It is just the same as a cooker burner: in order to prevent gas accumulation and the risk of explosion, it needs to be burnt. It would be logical to sell it but, so far, separation and refining cost more than the gas itself and so potential profits go up in flames. The training area of the TNK-BP drillers’ school in Nizhnevartovsk has everything it takes to become a professional driller: from a 1,000-tonne drilling unit to pumps and pipes. All of the machines are operational; you can turn them on and see how they work. “It takes from two weeks to one year to drill a single well, depending on the occurrence depth and certain other factors. This depth is about 2.5 kilometres in Yugra. In order not to have to drill several wells and move the unit, they often drill diagonally,” a lecturer explains. According to local tour operators, the demand for oil tours has soared more than 20-fold during the last decade. A one-day oil tour costs 1,000 roubles ($30). The school is not a tourist facility but a real educational institution training future and current oilmen. The former learn the ropes of the profession, while the latter upgrade their skills. The training ground is designed for practice, like a lab would be for chemists. Ordinary people cannot get here but, as part of a special exotic tour organised in the Khanty-Mansi Autonomous Region, you can see facilities that are normally closed to the public. “They have had similar tours in other countries for years. We introduced oil tours in Yugra back in 1999. Currently, one tour lasts half a day. We take tourists here, to the drillers’ school, and then go to Samotlor, an oil-bearing lake, where we visit one of the labs. They show how to separate oil from water there,” says Vasily Sochilin, Deputy Director of a big travel agency in Nizhnevartovsk. His company is the only one in Russia ready to open up the tightly closed world of oil production to outsiders. In 1965, the first oil was struck near Lake Samotlor. Though some countries have bigger oil reserves, Russia remains the leading oil producer. Yugra provides 57% of Russian oil and accounts for 7% of global oil production. “Bushes are typical of Yugra deposits,” says Vasily Sochilin. “We only have bogs here, so you can’t drill here. So you drain the bog first and then make a sand dump, called a ‘bush.’ We have these bushes everywhere. There are more road signs indicating bushes than there are for population centres,” Sochilin’s words are interrupted by icy blasts of wind. We are standing next to the lake’s main historical landmark of the lake: the monument to the first well. The dummy drilling device, which is so tiny compared to the giant real machines, reminds visitors that, in 1965, one of the world’s largest oil deposits was opened here. To a visitor from the mainland, as they refer to the European part of Russia here, this fact is just a piece of meaningless info, until you see with your own eyes how the black slush turns into ‘black gold’ and how the hard petrodollars that don’t stink are gained. Trucks swarm the artificial roads of Samotlor, oil pumps rock their heads rhythmically, gas flares burn and pipes release smoke. How to get there: The best way to tour Khanty-Mansiysk is by air (about $240 from Moscow). Khanty-Mansiysk is served by Khanty-Mansiysk airport, located just minutes away from the city.